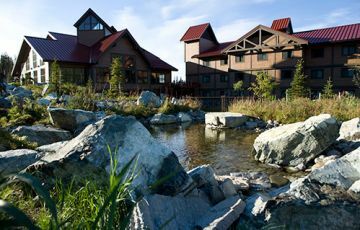 Princess offer a wide variety of Alaska vacation options for any traveler headed to Alaska. From cruisetours to independent lodge bookings, Princess offers any visitor to Alaska the widest range of choice. And with Princess as your guide, you can count on seeing nothing but the best this amazing land has to offer. With more coastline than the rest of the lower 48 combined, Alaska’s fabled inside passage and tidewater glaciers are a unique and incredible spectacle to behold. And no visit to Alaska is complete without visiting the vast, rugged interior of the last frontier, including Denali National Park. Our vacations to Alaska have it all! Princess Cruises Land & Sea Vacations offer the best of both worlds, combining the seven-day Voyage of the Glaciers cruise with a three- to eight-night stay on land. Choose a Denali Explorer cruisetour and venture to the center of the Great Land, or go off the beaten path to Copper River, Kenai or the Arctic. With so many cruisetours available, Princess is sure to have an Itinerary that's just right for you. 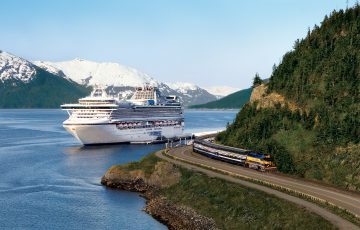 If cruising is not your first choice, our Alaska rail tour packages are just perfect. Princess Rail offers the easiest and most pleasant journey into Denali National Park available. 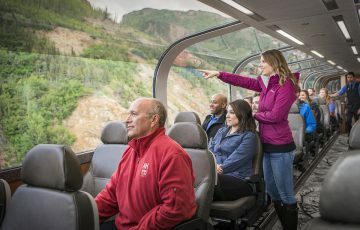 Our Alaska rail tour packages include rail and/or motorcoach transportation to and from Anchorage or Fairbanks and Denali Princess Lodge and/or Mt. McKinley Princess Lodge! Perhaps you want to spend some time in a specific region. Again, Princess can accommodate all your Alaska trip planning needs. Our lodges put you in places that you never thought you could be. Each offers the opportunity to experience authentic Alaskan excursions - including landing on a glacier, rafting a glacial river, riding horses in the backcountry, fishing world class Salmon runs, viewing wildlife or viewing Denali.